Readers of the Providence Journal may have noted the article on September 17th, explaining that Nathan Bishop renovations are on schedule for the planned Fall, 2009 reopening. The article quotes Alan Sepe, Providence’s Acting Director of Public Buildings as saying, “We’re on target…The building will be open next fall.” Here’s a link to the full article. We’ve learned from Ward 2 Councilman Cliff Wood, who has worked very hard to help create the new Nathan Bishop, that there will be an official groundbreaking ceremony at Nathan Bishop on Thursday, October 2nd at 3:30 p.m. In addition to Cliff, the ceremony will also be attended by Mayor Cicilline, Majority Leader Gordon Fox, and Senator Rhoda Perry, who have also been supporters of this project. We hope that many of you will be able to join us in marking this occasion and showing your support for Nathan Bishop. The interview committee included Providence Public School Department staff and several of the parents and community members who have participated in the various versions of the Superintendent’s Bishop committees. The interview committee forwarded the names of the top candidates to the administration, and we understand that Superintendent Brady has been conducting subsequent interviews. We had hoped that the new principal could be hired full time this fall, but have learned that funds are not available for this. Instead, we expect that the individual selected will participate in the planning process on a part-time basis through next summer. Superintendent Brady will meet with the Nathan Bishop planning committee on Tuesday, Sept. 23rd. At that time we hope to hear more about the principal selection. We also hope to hear more at the 9/23 meeting about the timetable and process for finalizing the plans for Bishop. The committee which will be responsible for planning the curriculum and school governance procedures, in accordance with the vision created over the past two years, will be known as the “Community Engagement Committee”. We previously had been told that this committee, which would include a broader range of teachers, education experts and PPSD staff than the current committee, would be established and at work by now. We hope that work on this critical project will begin very soon. We also expect that the School Department will solicit community members for participation on various subcommittees and we will pass along information as we receive it. ESPEC’s Spring public forum was devoted to the renovations to the Bishop building and the physical design of the new school. At that time we announced plans for a second forum, to be devoted to the academic program, school governance issues and so on. Various events, including change of superintendents, made it necessary to postpone this forum until this fall. The ESPEC steering committee has written to Superintendent Brady, requesting his assistance in providing this opportunity for the community to learn more about Nathan Bishop. We hope that both Mr. Brady and the principal-designate will appear to discuss their vision for the school. We will let you know more as soon as we are able. 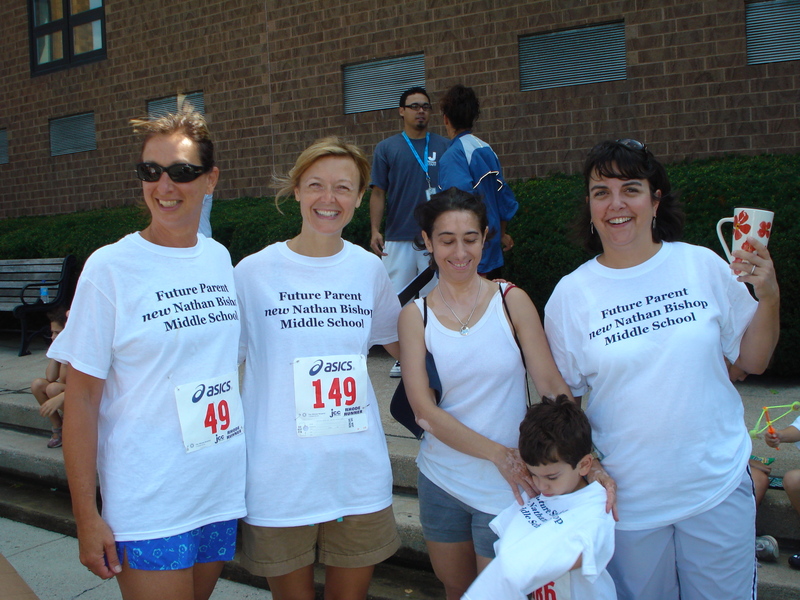 The annual 5K race hosted by the Jewish Community Center and Miriam Hospital was held on September 7th. 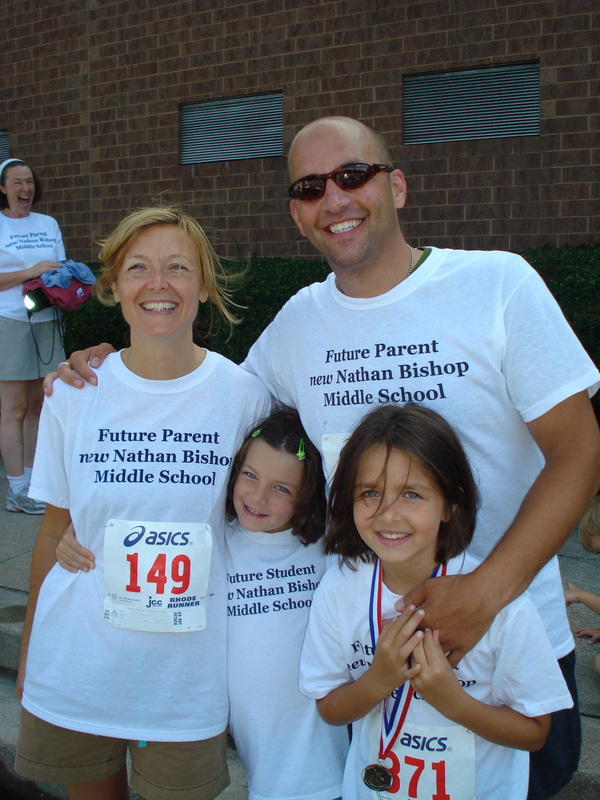 ESPEC sponsored a team, and sold “Future Nathan Bishop Parent” and “Future Nathan Bishop Student” shirts. Here are a few photos. [If you would like one of these shirts, contact Karina Wood at KarinaWood(Insert@here)cox.net],.